It has been estimated that over 45 million Americans have at least one tattoo and a growing percentage of this group reports a desire to remove their ink. Without a doubt, the easiest method for tattoo removal is a series of laser treatments. However, the reality of laser tattoo removal is that it’s impossible to predict exactly how many treatments you’ll need or if the ink can be completely removed. Since laser tattoo removal is unpredictable by nature, you need a physician expert to guide you through the process. 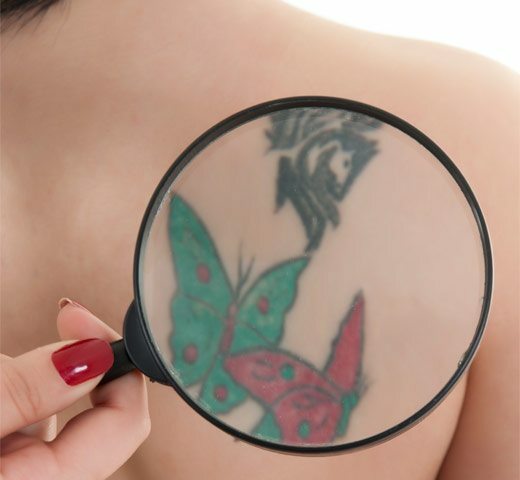 At your tattoo removal consultation, we’ll recommend the best laser or lasers for you based on several factors such as skin type, as well as the depth, age, type and color(s) of the tattoo ink. First of all, no one can precisely predict how many tattoo removal treatments you’ll need. There are several factors that will ultimately determine the number of sessions needed and there’s also a high degree of variability in the response of the ink to treatment. During your consultation, we’ll assess the tattoo and your skin and give you an estimated range of sessions needed. Also, we’ll discuss realistic expectations about the process and give you a price quote. Laser treatments for tattoos aren’t nearly as painful as they’re rumored to be. In fact, most people describe it as feeling like a rubber band snapping against the skin. Nevertheless, everyone has a different pain tolerance and your comfort during treatment is extremely important to us! We’ll use either topical numbing or injectable numbing before each of your treatments so that you feel as little discomfort as possible. Typically, the side effects from laser tattoo removal treatments are very manageable. However, you should understand that there is a potential for temporary tenderness, swelling, blistering, scabs and redness after your sessions. Nevertheless, during your visit we’ll show you how to care for your skin at home as it heals. Lastly, there is a small chance that you could develop changes in skin pigment around the tattoo (either darkening or lightening). If hypo or hyperpigmentation does occur, it usually will also resolve on its own, with time. For that reason, we strongly recommend that tattoo removal treatments only be performed by board-certified physicians with extensive experience performing laser treatments.